32 “Revolution at the Crossroads"
Jose LaLuz is Executive Director of Servidores Publicos Unidos de Puerto Rico/AFSCME (United Public Employees of Puerto Rico). He is currently associate director of the leadership academy of the American Federation of State, County and Municipal Employees (AFSCME) and a vice chair of the Democratic Socialists of America. La Luz is credited as the architect of a grassroots campaign that resulted in a 1998 law granting bargaining rights and the right of unionization to 120,000 public employees in Puerto Rico, and in 2011 led a successful campaign to restore those rights after the Republican governor Rico Luis Fortuno passed fiscal austerity legislation that had nullified the law. A native of Santurce, Puerto Rico, La Luz comes from a working-class family and spent his primary school years on the island. La Luz’s grandfather used to take him to the tobacco, coffee and sugarcane fields, where he saw first hand the plight of poor Puerto Ricans toiling in the fields for a meager livelihood and malnourished children with swollen bellies living in unhygienic shacks with no running water or electricity. The fight for basic rights and justice for all people became his life’s passion. His role models were his grandfather, who worked in a New Deal program: the Puerto Rican Reconstruction Administration; two progressive governors of Puerto Rico: Luis Munoz Marin and Rexford Guy Tugwell; and President Franklin D. Roosevelt. La Luz graduated from the State University of New York’s Empire State College with a B.A. in labor studies and earned a M.A. in labor studies at Rutgers University. He has been a visiting labor leader in residence at Cornell University and a Wurf Fellow in the Kennedy School State and Local Government Program at Harvard University, and received a lifetime award as an outstanding labor educator from the United Association for Labor Education. During his college years, La Luz joined Students for a Democratic Society and local Puerto Rican farm workers’ organizations in the Tobacco Valley in Connecticut and Massachusetts. He also worked with Cesar Chavez’s United Farm Workers of America and the Puerto Rican Socialist Party, which later expelled him for being a “social democrat” instead of primarily nationalist. He eventually became active in Democratic Party politics while he launched his labor organizing career, which included serving as international director of the Amalgamated Clothing and Textile Workers’ Union during the 1990s and playing a prominent role in the debates over NAFTA, advocating for strong labor rights and environmental protection. As staff of AFSCME, in 2008 he was “on loan” to Hillary Clinton’s primary election campaign and later trained Hispanic activists in the Obama presidential campaign. Jose La Luz, P.O. Box 1043, Caygasm, Puerto Rico, was listed among the members of the Third "Venceremos Brigade" (VB) travelers to Communist Cuba in the Congressional Record (CR), November 8, 1972, pp. E 9089 - E 9098 (Extension of Remarks) by Sen. James Eastland (D-Miss), of his remarks in the Senate on October 18, 1972, "Americans Train in Cuba For Revolution". The full list of the participants of the first 5 VB trips to Cuba are found, along with this Congressional Record report (and several others) in "The Theory and Practice of Communism in 1972, (Venceremos Brigade), Part 2, Hearings, House Internal Security Committee (HISC), Oct. 16, 18 & 19, 1972. In the early 1970s Jose LaLuz was active in the Connecticut branch of the Puerto Rican Socialist Party with Eric Vega. Allied to Castro's Cuba, the Marxist-Leninist PSP agitated for Puerto Rican independence and committed several bombings and other terrorist acts on U.S. soil. LaLuz was expelled from the PSP in 1976 and went on to to join the Democratic Socialist Organizing Committee the following year. He became Chairman of the Hispanic Commission of DSOC, before the merger with the New American Movement that created Democratic Socialists of America in 1982. In 1976 Jose LaLuz for Puerto Rican Socialist Party Central Committee attended the Weather Underground and Prairie Fire Organizing Committee organized Hard Times Conference Jan 30 - Feb 1 at the University of Chicago. Workshops included "Organizing Hispanics" - Jose LaLuz, moderator, Pancho Medrano, Gilbert Padilla. In 1992 Jose LaLuz was a member of the Democratic Socialists of America Racial Diversity Task Force - charged with finding ways of recruiting (and retaining) more "people of color" into the organization. 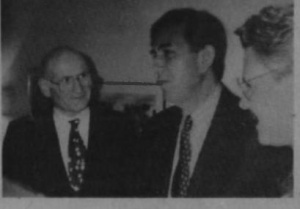 On April 17, 1993 Democratic Socialists of America hosted a reception for an "extremely distinguished delegation of democratic socialist leaders from Latin America". The guests, all of whom would be running for president of their respective countries within the next year, included Ruben Zamora of El Salvador, Cuauhtemoc Cardenas of Mexico, Antonio Navarro Wolff of Colombia, and Luis Ignacio Lula da Silva (Lula) of Brazil. ACTWU President Jack Sheinkman, DSA NPC member Jose LaLuz and reception host Gene Eisner, participated. in 2000, Jose LaLuz was the Executive Director of Servidores Publicos Unidos de Puerto Rico/AFSCME (United Public Employees of Puerto Rico). He had been on assignment in Puerto Rico since 1995, coordinating AFSCME efforts to achieve collective bargaining rights and to organize more than 150,000 public service workers as part of a multiunion coordinated organizing project which includes SEIU, UAW, AFT, UFCW, AFGE among other unions in the AFL-CIO. 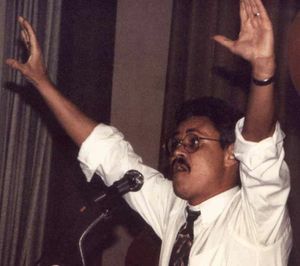 Jose LaLuzhad been a democratic socialist long before he joined the Democratic Socialist Organizing Committee (DSOC) in 1977, when he became the Chair of the Hispanic Commission of DSOC, before the merger with the New American Movement that created DSA. He previously had been a leader of the U.S. Branch of the Puerto Rican Socialist Party and was responsible for organizational and trade union activities before he was expelled for being a "social democrat". In the late 1980s LaLuz was active Communist Party USA initiated and dominated U.S. Peace Council-an affiliate of the Soviet front World Peace Council. Jose LaLuz was a guest speaker at the Democratic Socialists of America Youth Section 1992 conference. In the mid 1990s LaLuz wasa contributing editor to Oakland based Institute for Social and Economic Studies- sponsor of CrossRoads magazine, which sought to promote dialogue and building new alliances among progressives and leftists... and to bring diverse Marxist and socialist traditions to bear while exploring new strategies and directions for the progressive political movements. At the Committees of Correspondence conference, Berkeley California, July 17-19, 1992. LaLuz was a candidatefor the CoC National Coordinating Committee-from New York, DSA Latino Comm. ACTWU Ed Director. In the closing plenary on Saturday, Temple University political theory professor and DSA Vice- Chair Joseph Schwartz, prominent socialist-feminist theorist Nancy Fraser, and veteran trade union leader and DSA Vice Chair Jose LaLuz addressed the continued importance and relevance of democratic socialist values to building mass social movements for racial, economic, and gender justice. In 2008 Jose LaLuz was the chairman of Latinos for Obama and campaiged in Colorado and New Mexico registering, educating and mobilizing voters until Election Day. He was also the director of the Leadership Academy with the American Federation of State, County and Municipal Employees. The historic Nov. 4th presidential election is less than two months away, and a monumental battle is heating up in a few crucial swing states, as some nine million Latino voters prepare to cast their ballot, which could be the deciding factor for an Obama win. In New Mexico, Obama leads McCain 56 percent to 23 percent among Latino voters. Among non-Latino voters McCain leads 50 percent to 34 percent. In Colorado, Obama has a 56 percent lead over McCain’s 26 percent among Latinos. And among non-Latino voters Obama has a narrow 45 percent lead over McCain’s 41 percent. In Nevada, Obama leads McCain at 62 percent to 20 percent among Latinos. Yet McCain leads among non-Latino voters at 46 percent to 37 percent. Jose LaLuz is the chairperson for Latinos for Obama and is campaigning in Colorado and New Mexico registering, educating and mobilizing voters until Election Day. He is also the director of the Leadership Academy with the American Federation of State, County and Municipal Employees Union. LaLuz spoke with the Peoples Weekly World during an AFL-CIO labour forum at the Democratic National Convention in Denver. Between now and Election Day LaLuz said that the Obama campaign is registering voters in New Mexico and Colorado and developing lists of tens of thousands of Latino supporters for Obama. President Bush won 40 percent of the Latino vote in 2004, a key factor in his win. Even though John Kerry lost Ohio then, many Democrats feel if Kerry had won Nevada, New Mexico and Colorado, he would be president today. Things have changed since then and the margin of victory is in the Latino vote, particularly in these states, respectively, Democrats say. Polls across the country concur and find that Latinos are fed up with the Bush administration and the Republican Party represented by McCain and see Obama as the person to change course for the better. In 2009 Jose LaLuz was listed as an endorser of the Center for Labor Renewal. Nydia Velazquez, actress Melissa Fitzgerald, Jose La Luz, Obama campaign event Orlando October 2012. Congressman Luis V Gutierrez your devotion to the cause for Immigrant Rights inspires us all ! Si Sé Puede ! — with Lolalegriamaria Rodz, Douglas Rivlin and Isabel Vinent Grimany. Mapping Socialist Strategies was convened from August 1-4 in Briarcliff Manor, NY, by the Rosa Luxemburg Stiftung—New York Office. It brang together 100 influential progressives and leftists from across the United States, Canada, and Europe for an “un-conference” on socialist strategies. Jose La Luz, Toni Harp, Maribel La Luz, 2015. Jose La Luz, Hillary Clinton, Bill Clinton. Over 300 Sanders activists attended Democratic Socialists of America’s “Socialist Caucus” on Wednesday afternoon, July 27th, 3016. In the audience were over 100 Sanders delegates, including most of DSA’s 55 member-delegates; they were joined by Larry Sanders, Senator Sanders’ brother, and the Senator’s son, Levi Sanders. Jose LaLuz with Eva Longoria. The plenaries continued Saturday, with the first focused on introducing many of the new members to Democratic Socialism. On the panel were Joseph Schwartz, member of DSA's National Political Committee and DSA vice-chair; Dan La Botz, author and long-time trade union activist; and Rahel Biru, co-chair of New York City DSA. They were followed later in the day by Jose La Luz, trade unionist and DSA vice-chair, and Komozi Woodard, professor at Sarah Lawrence College, who spoke on people of color in socialist movements. Of particular note was Jose LaLuz's rousing call to arms against the Trump administration, delivered without the use of a microphone, which received a standing ovation. Bringing Big Organizing to the Single Payer Movement – Becky Bond, former senior advisor to the Bernie Sanders presidential campaign and co-author of Rules for Revolutionaries: How Big Organizing Can Change Everything. This is What Victory Looks Like – Jose La Luz. In 2018 Jose LaLuz was an original signatory of the DSA North Star founding principles statement. ↑ Dem.Left, May/June 1993, page 14. This page was last modified on 4 February 2019, at 03:50.